When gardeners hear the name “broom” they often cringe at the thought of hillsides covered by the invasive Scotch broom (Cytisus scoparius) in California. Fortunately for all of us, the form of “broom” chosen by Plant Select® is no such brute. 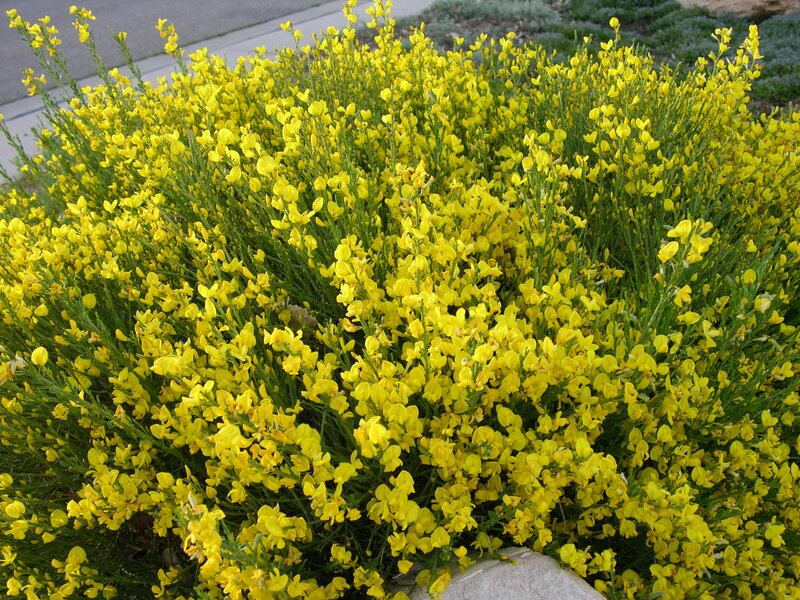 Native to the high mountains of Spain, Spanish Gold® Broom (Cytisus purgans) is a tidy, drought-tolerant “evergreen” shrub that is adaptable to our alkaline soils, hot summers and cold winters. Like many brooms, the stems of Spanish Gold® Broom are generally green and stick-like (hence the name) and covered with small green leaves from spring until early fall. The yellow pea-like blossoms are very fragrant (a vanilla-like aroma) and last for a couple of weeks in early spring. In the landscape, Spanish Gold® Broom is best used for its formal mounding shape and unusual texture. In mixed borders, it complements a wide variety of plants, including perennials, grasses, other shrubs and conifers. It looks just as attractive in both “natural” and formal plantings. Dry conditions are preferable, especially once established, but because its stems are green all year round, it should be monitored for winter moisture. Pruning is only necessary to remove occasional winter die-back. Culture: gravelly, clay or loam soils; Intolerant of poorly drained soils. Requires little care once established. Contributed by Pat Hayward, executive director of Plant Select®. Boulder CO. 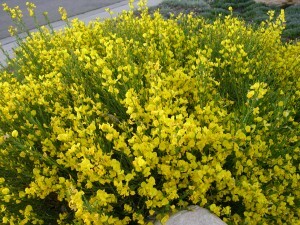 I have 2 plants of Spanish Gold® Broom (Cytisus purgans). One of 3 planted 2008 has died. One is small, green from tip to ground. One is huge, but every branch is tan/brown and dry/brittle from tip to ground. I’d like advice on the huge dry bush — remove, prune all branches to near the ground now (March 6), just wait, or what? Thanks! I’ve had that same thing happen on older plants. I think the best thing to do is wait and see if any new growth pushes from the base on the dead-looking one. if you seen new growth then prune out all the brown stems. If no growth, then of course it it’s dead. The big one can be pruned just as soon as you see new growth, and then maybe just take it back 1/3 to 1/2. You could take SOME branches all the way to the ground, but not to the whole thing or you’ll likely lose that one too.. Look around too. I’ve had a couple of old ones die on me but it always seem there was one seedling to take its place, so I moved the seedling when young to take the place of the old one. Where can I buy or order this shrub? This is a very popular plant in Colorado. You should be able to purchase it at any independent garden center. If you are out of state, try one of our on-line retailers at this link. I have 2 healthy looking shrubs I planted last year however neither bloomed this year. I was so disappointed…do they not bloom the first couple years or is something wrong? You should have seen some blooms on them this year, however it is true that the more mature they get the more prolific the blooms. One factor that may reduce blooming is shade. These plants need full, hot sun all day long for best performance. If that is the case then try to provide more light pruning larger trees or shrubs. If that can’t be done, transplant those plants now, providing them with ample water to get through the rest of the year. Thanks. They’re in full sun, and are beautiful but I think I’m just out of luck this year on flowers. Thought it was weird though. Maybe early next spring I’ll do a couple light rounds of natural fertilizer, like the Big Bloom liquid and see if I can’t force a few out!